Denise L. Crone age 99 of Ashland, passed quietly away on March 15, 2019 at her residence with family at her side. Born on January 19, 1920 in Akron, Ohio, she was the daughter of Daniel D. and Golda (Enlow) Lugthart. She was an Ashland County resident most of her life. 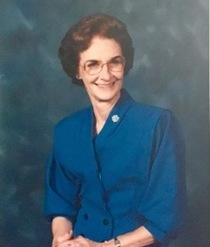 Denise was employed as the Chief Deputy Clerk of the Probate Court for 34 years before she retired. Prior to her time at the Probate Court, she was employed with the F.E. Myers Company as an executive secretary. Denise lived an active and adventurous life. She was the first woman in Ashland County to receive her private pilot’s license. She went parasailing when she was 70, copiloted a biplane when she was 80 and copiloted a Ford Tri Motor Aircraft when she was 90. On August 30, 1941 Denise was married to Homer H. Crone who preceded her in death in 1985. Surviving are three daughters and two sons-in-law; Terry and Curtis Stoldt of Bellvue, Ohio, Sherry Johnston of Ashland and Liz and Jay Myers of Ashland. Also surviving are two grandchildren; Whitney Stoldt of New Hampshire and Cameron Stoldt of Bellvue, Ohio. Numerous nieces and nephews also survive. In addition to her husband Homer, she was preceded in death by her parents, step son Gerald Crone, sister Betty Tanner and brother Neil Lugthart. Funeral services will be held at the Heyl Funeral Home on Thursday March 21, 2019. Calling hours will begin at 1:00 p.m. and the Funeral Service at 2:00 p.m. with Minister Walter L. Dronebarger officiating. Burial will follow in the Ashland Cemetery.